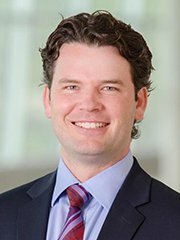 UNMC › Radiation Oncology › Faculty › Nathan R. Bennion, M.D. Grant funded prospective study to assess the effects of virtual reality-based education to reduce anxiety in patients undergoing radiation to the head and neck region. Cross-sectional observation study of side effects and perceived quality of life after radiotherapy. Baine MJ, Dorius T, Bennion NR, Smith L, Zhen W, Ganti A. Weight loss and percutaneous endoscopic gastrostomy tube placement during chemoradiotherapy for locally advanced cancer of the oropharynx do not negatively impact outcomes. Front Oncol 2017. Baine MJ, Dorius T, Bennion NR, Alam M, Smith L, Zhen W, Ganti A. Chemoradiotherapy for locally advanced squamous cell carcinoma of the oropharynx: Does completion of systemic therapy affect outcomes? Oral Oncol. 2017. Bennion NR, Baine MJ, Malouff T, Zhen W. Osteosarcoma of the Larynx: Treatment Outcomes and Patterns of Failure Analysis. Rare Tumors 2017. Zhou C, Bennion NR, Ma R, Liang X, Wang S, Zvolanek K, Hyun M, Li X, Zhou S, Zhen W, Lin C, Wahl A, Zheng D. A comprehensive dosimetric study on switching from a Type-B to a Type-C dose algorithm for modern lung SBRT. Radiat Oncol, 2017. Mao B, Verma V, Zheng D, Zhu X, Bennion NR, Bhirud A, Poole M, Zhen W. Target Migration from Re-inflation of Adjacent Atelectasis During Lung Stereotactic Body Radiotherapy. World J Clin Oncol, 2017. Wang S, Zheng D, Zhang C, Ma R, Bennion NR, Lei Y, Zhu Xiafeng, Enke C, Zhou S. Automatic planning on hippocampal avoidance whole-brain radiotherapy. Med Dos, 2017. Bennion NR, Malouff T, Verma V, Denniston K, Bhirud A, Zhen W, Wahl A, Lin C. A comparison of clinical and radiologic outcomes between frame-based and frameless stereotactic radiosurgery for brain metastases. Pract Radiat Oncol, 2016. Bowers J, Bennion NR, Kersh R. Stereotactic Body Radiation Therapy (SBRT) For Centrally Located Primary and Recurrent Non-Small Cell Lung Cancer (NSCLC0: Analysis of Toxicity and Local Control. J Radiat Oncol. Accepted 2016. Malouff T, Bennion NR, Verma V, Martinez GA, Balkman N, Bhirud A, Smith T, Lin C. Which Prognostic Index is Most Appropriate in the Setting of Delayed Stereotactic Radiosurgery for Brain Metastases? Frontiers in Oncology, 2016. Zhou S, Zhu X, Zhang M, Lei Y, Li S, Bennion NR, Verma V, Zhen W, Enke C. Estimation of internal organ motion-induced variance in radiation dose in non-gated radiotherapy. Phys Med Bio, 2016. Denniston KA*, Verma V*, Bhirud AR, Bennion NR, Lin C. Effect of Akimbo Versus Raised Arm Positioning on Breast and Cardiopulmonary Dosimetry in Pediatric Hodgkin Lymphoma. In press, Frontiers in Oncology, 2016. Bennion NR, Harry Lomas, Ronald Kersh, Clinical Evaluation Report on “External Beam Radiotherapy for Spine and Bone Metastases”, Accepted, Elekta, 2016. Gharzai L, Verma V, Denniston K, Bhirud A, Bennion NR, Lin C. Radiation Therapy and Cardiac Death in Long-Term Survivors of Esophageal Cancer. In press, PLoS One, 2016. Bennion NR, Nowak RK, Lyden ER, Thompson RB, Li S, Lin C. Fractionated Stereotactic Radiotherapy for Vestibular Schwannomas: Dosimetric Factors Predictive of Hearing Outcomes. Pract Radiat Oncol, 2015. Dorius TH, Bennion NR, Armitage JO. PET-directed therapy in Hodgkin lymphoma: Ready for prime time? Expert Rev Anticancer Ther. 2015. Verma V, Kulkarni RR, Bhirud A, Bennion NR, McComb R, Lin C. Metachronous Medulloblastoma and Glioblastoma: Implications for Technical Aspects of Re-Irradiation. Rep Pract Oncol Radiother,. In Press, 2015. Verma V, Johnson CP, Bennion NR, Bhirud A, Lin C. Atypical teratoid rhabdoid tumor: long-term survival after chemoradiotherapy. In Press, Childs Nerv Syst, 2015.